This is one of the first questions we typically get when someone is visiting any of our stores for the first time. When you enter you see an array of different combinations of colors. Though paletas may look like ordinary popsicles, this dessert packs a much larger punch. Paletas are a Mexican frozen treat made from fresh natural fruits such as strawberry and mango or made from rich creamy ingredients such as Chocolate and Sicilian pistachio. The right mix of these main ingredients with secondary ingredients such as water, milk, condensed milk among others, opens a whole world of flavor possibilities. 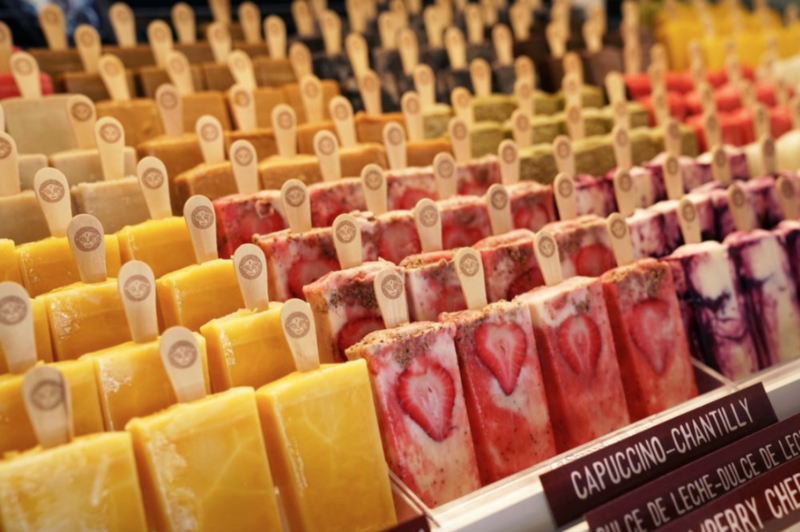 Though fruits are a common base ingredient for a typical Mexican paleta, more milk-based ice cream paletas are also available. For those less interested in fruity flavors, our paleta shops offer classic creamy flavor options like Belgian chocolate. With chocolate ice cream accounting for 14% of total US sales, we’d be remiss to exclude it from our menu! The key to delicious paletas is their simplicity. Natural fruits, a bit of water, and other ingredients like yogurt are blended, then poured into a mold and chilled. The process may change based on ingredients. Some paletas include a deliciously oozy cream, condensed milk, or dulce de leche center. When making and gourmet food, quality ingredients are key. At Morelia’s, we use all-natural, fresh ingredients. To ensure each paleta reaches its full potential, we make them in small batches every day. With our focus on quality, you’ll taste the difference. If you’re looking for one of the best heladerias en Miami, don’t just Google “popsicle shop near me.” Come to Morelia Gourmet Paletas – We’ll show you just how magical a “popsicle” can be. what makes morelia gourmet paletas different from other pops shop? Aside from having a high-quality delicious product, you can enhance your experience by dipping your paleta and adding some toppings to take the flavor to the next level. At our popsicle store, Paletas Morelia, you can add a bit of crunch with nuts or a chocolate coating to top it all off! Our signature S’mores Topping is something you want to try. Liquid marshmallow fluff torched with fire and topped with Graham Crackers.